The big offensive has begun! Allied forces have assembled a commando unit of metahumans with extraordinary powers destined to tip the scales in their favour. But what terrible resistance will they meet? 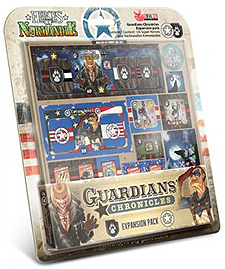 This expansion lets you live the fight of the Meta Squadron and their allies against Anja and her werewolf pack by introducing superheroes and supervillains to your Heroes of Normandie games!